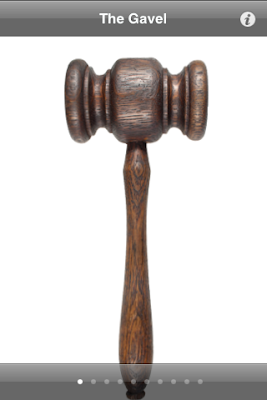 Eye Dull Musings: The Gavel! Having trouble keeping order in your meetings? Not receiving the proper level of respect from those around you? Then buy this app! Badger your peers into submission with the constant banging of a judge's gavel or several other thumping items. There's even a Krushchev mode for thumping with a shoe. (Please refer to 1960s political history if you don't know the reference.) And if thumping a virtual shoe at someone doesn't get one's attention, you can always try a real shoe, but this app doesn't include a real shoe. You'll need to supply that yourself. What this app does include are several virtual items with realistic sound effects: a gavel (in a few different styles), a wooden mallet, a carpenter's hammer, a sledgehammer, a dead fish and more! The attention each item demands will vary depending on the anger in your swing. Check out the full description in iTunes here. I can't imagine how I've gotten this far without this! This could change my life in ways I've never imagined! I've said it before- you're a geinous, genuos, jeanious,-- you're really smart.